The UN Security Council has discussed a draft resolution on ridding Syria of chemical weapons after the US and Russia agreed the text. A vote in the 15-member Council could now take place later on Friday, diplomats at the UN in New York said. The agreement breaks a two-and-a-half year deadlock in the UN over Syria. It is seen as a key step in a US-Russia brokered plan earlier this month under which Syria agreed to disclose its arsenal and eliminate it by mid-2014. Russia and China have three times blocked Western-backed resolutions in the Security Council against Syrian President Bashar al-Assad. The council discussed the draft resolution on Thursday evening at the UN headquarters. Moscow and Washington had earlier disagreed over the wording of the draft. The US - backed by France and the UK - had pushed for a resolution carrying the threat of military action. Russia had opposed this. The five nations are permanent veto-wielding members of the council. But a deal was struck on Thursday. The US Ambassador to the UN, Samantha Power, tweeted: "Agreement reached w/Russia on UNSC [UN Security Council] Resolution legally obligating #Syria to give up CW [chemical weapons] they used on their people. Going to full UNSC tonight." She added that the draft "establishes that Syria's use of CW is threat to international peace & security & creates a new norm against the use of CW". British envoy Sir Mark Lyall Grant also described the document as "binding and enforceable". Russian Foreign Minister Sergei Lavrov confirmed that an agreement had been reached. Although the draft refers to Chapter VII of the UN Charter, which allows the use of military force, a second resolution authorising such a move would be needed. This is something that Russia would almost certainly veto, the BBC's Nick Bryant in New York reports. The proposed resolution also says that those responsible for the use of chemical weapons in Syria "should be held accountable". But there is no mention that they should be tried at the International Criminal Court - a significant weakening from previous drafts, our correspondent adds. Nevertheless, one senior official at the US state department described the agreement as a "breakthrough", saying the document "makes absolutely clear that failure of the Assad regime to comply will have consequences". US and Russian officials later said a vote on the proposed resolution could take place as early as Friday evening. Can China keep staying silent? The Organisation for the Prohibition of Chemical Weapons (OPCW) still has to signal that it has accepted the US-Russian plan agreed earlier this month. 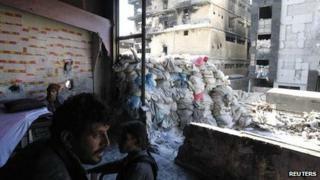 Then chemical experts can start taking practical steps towards inspecting and securing Syria's stockpiles. Washington had threatened the Syrian government with military action over a chemical weapons attack in the Ghouta area of Damascus on 21 August. A UN report on the attack published later confirmed that the nerve agent sarin had been used in a rocket attack there, although it did not apportion blame. France, the UK and US insist the report clearly backs their stance that only the government forces were capable of carrying out the attack. Russia rejects this argument. Mr Lavrov has said that Moscow has "serious grounds" to believe the attack had been a provocation by rebel forces. President Assad also says the opposition forces were to blame. More than 100,000 people have died since the uprising began in 2011. Millions of Syrians have fled the country, mostly to neighbouring nations. Millions more have been internally displaced.